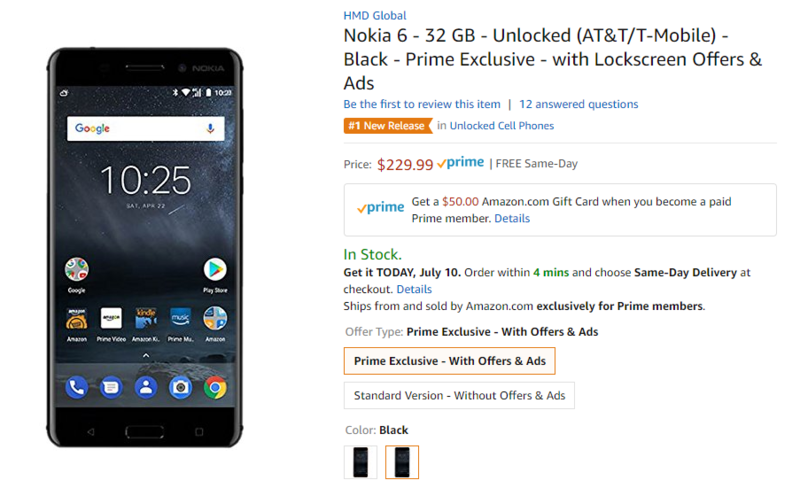 New unlocked phones pop up on Amazon Prime from time to time, and sometimes they're even important enough to warrant a post. Today is special, though. There's not one, not two, but four new unlocked phones available on Amazon with Prime-exclusive variants: the Nokia 6, Alcatel Idol 5S, A30 Plus, and A50 (left to right above). They're all priced competitively, and you can save some cash if you don't mind ads. The Nokia 6 launched in Asia a while back, but now the Nokia HMD partnership has arrived in the US. This phone has a Snapdragon 430, 3GB of RAM, and a 5.5-inch 1080p display. It costs $229.99 or $179.99 with Amazon ads. The Alcatel Idol 5S is a less expensive device than the 4S, priced at just $279.99 or $199.99 with Amazon ads. It has a Snapdragon 625, 3GB of RAM, and a 5.2-inch 1080p display. If you're looking for something a little cheaper, Alcatel has the A50 and A30 as well. These phones both run a cheaper MediaTek MT6738 SoC with 2GB of RAM, 16GB of storage, and 720p screens (5.5-inch on the A30 and 5.2 on the A50). The A30 Plus retails for $129.99, or just $79.99 with Prime. The A50 is $149.99 regular or $99.99 with Amazon ads. All four phones are available today on Amazon's US site. The Nokia 6 is also, apparently, the top new release in unlocked cell phones. Find them all below.